Unbelievably, Irene’s father-in-law, J. Logan Jones, was born in 1859 in Kansas inside of a wigwam in Ottawa, Kansas Indian Territory, when his mother went into labor during the Jones family’s trip by wagon to the Lawrence area to farm. That area was an uncomfortable place to farm during the Civil War and, after only two years, the family returned to Illinois. Twenty year-old J. Logan and twenty-two year-old Lawrence M. Jones left their parent’s Illinois farm in 1879 and used their savings to acquire a small local mercantile store. They made a success of that business, sold it and opened a larger one in the county seat, then did the same in a bigger town, then on to Stafford, Kansas, then to Kansas City, Kansas, where they opened a store on Minnesota Avenue and, in 1893, they opened their Jones Dry Goods business in a leased six story building at 6th and Main Street in Kansas City, Missouri, where, their first year in business, sales were a half a million dollars. The brothers always attributed the success of the Jones Brothers Mercantile Company to their aggressive advertising. Luckily, when that leased store burned to the ground in 1899, they had fire insurance, a large mail order business doing several million dollars a year, and a warehouse in another location that survived. When they reopened their business, it was in the form of a gigantic seven-story department store located in downtown Kansas City between 12th and 13th Streets on Main Street. It was the largest department store in the city. By 1902, they sold everything imaginable from screen doors to fancy hats to groceries to eyeglasses. They were a home improvement store, drug store, furniture store, clothing store, grocery store, and much more. In 1906, they even opened a bank inside the store to accommodate their over 1,000 employees as well as the public. Interest rates were 4% and any deposit from 50 cents on was welcomed. By late 1910, the hugely successful business that allowed the brothers to build large homes and to enjoy mingling with the upper echelons of society, fell on hard times. Overextended in loans for unsold inventory, the business was thrown into involuntary bankruptcy by nervous creditors. The store’s overstocked inventory of winter coats and suits, ordered on the basis of a booming business the year before, went unsold due to an unusually hot fall and winter followed by a cold spring of constant rain leaving more inventory unwanted and unsold and causing bills to go unpaid. The Jones’ business was doomed by circumstances beyond their control. J. Logan, as vice president, in an interview with the Kansa City Star in 1910, told of the store’s history. In another article in that same paper, Lawrence, speaking as president, indicated that they would “go on”. The business did go on but no longer under the Jones brother’s ownership. It was sold through the years to a succession of out-of-town conglomerates where it and branches established over time in suburban areas survived for over a hundred years until Macy’s acquired the brand in 2006. The 500,000 square-foot downtown store was closed in 1998 and demolished in 2005. During the early successful years of the store, J. Logan built a mansion, “Thorneycroft”, at 301 East Armour Blvd, daily walking to work according to contemporary accounts. In 1915, J. Logan did make a business comeback by opening a bargain store named “Logan Jones Dry Goods Store” that was located at 7thand Main, north of the 8th Street Viaduct. Although considered to be a very unfashionable location, he turned it into a profitable venture by selling discounted merchandise allowing him a comfortable retirement 20 years later to Long Beach, CA. He died in 1945 at age 86 on a visit to Kansas City. In the 1940 U.S. Census, Strang’s niece, Irene and husband, C. Vernon Jones, were living in Kansas City on 59th Street close to Wornall Road and C. Vernon is listed as being in sales. Following, no doubt, in the footsteps of his father in the store although not in as large a scale. Of course, J. Logan Jones’ relationship to the Strang family and Overland Park is only part of the history of the Jones Brothers Dry Goods Store. As Paul Harvey used to say, “Here is the rest of the story”. The brothers had begun their businesses together, owning their stores jointly, until thrown into bankruptcy. The store stock was then acquired by a wealthy New Yorker by the name of John Claflin. He was associated with one of the largest wholesale dry goods firms in the U.S., H.B.Claflin & Co. In January of 1911, however, John used his own money, paying cash, to buy the store’s inventory at 50cents on the dollar. The store went through another bankruptcy scare in 1914 when the Claflin Company went bankrupt, but escaped because John Claflin was sole owner, not the company. When he acquired the business, Claflin cleverly retained both brothers in a managerial capacity. J. Logan left in 1912 and went into business for himself but Lawrence remained as president of the Jones Store Company and stayed in that capacity until 1919 when his son, Chester, took over that position. Lawrence then served as chairman of the board until he was 80 years old, retiring in 1936 to Arizona. 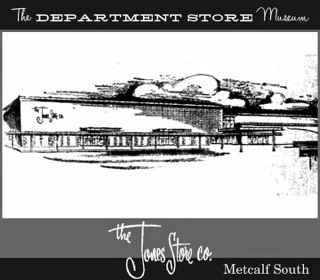 Through the years, The Jones Store Company was owned by several conglomerates including the May Company Department Stores before the sale to Federated Department Stores/Macy’s in 2006. The store back in 1909 was to Kansas City as Selfridges was to London in that era. On November 27, 1909, just eleven months after the first area flight of an aeroplane occurred in Overland Park, the Jones Store displayed a duplicate of a Curtiss aeroplane that had recently won an international race in Rheims, France. The aeroplane, a shared a display featuring the fur clothing worn by explorer, Dr. Frederick Cook, who claimed to be the first to reach the north pole, and the opening of a “Fairyland” for children in the toy department all took place on the second floor, simultaneously, drawing enormous crowds. Meanwhile, the third floor advertised a 300 seat “theaterette” featuring Christmas programs. Lawrence Monroe Jones was married in Illinois in 1881 to the former Emma Williams. They had four children: three girls and one boy. It was commonly thought that Lawrence had been named for Commodore James Lawrence who, during the War of 1812, is remembered as having uttered, on his deathbed aboard the frigate, Chesapeake, the words, “Don’t give up the ship!” Lawrence, himself, lived up to those words in many respects during his lifetime. Not only as head of the Jones Store but as a civic leader in Kansas City when he fought for cleaning and deepening the Missouri and Kaw Rivers for freight traffic, and where he belonged to various clubs and chaired the Priests of Pallas celebrations. He was always an advocate for the city and especially its clothing manufacturers. He was a delegate to the 1908 Republican National Convention in Chicago, casting a vote for William Howard Taft. He served as an elector for Taft’s presidential election. Lawrence proved just how tough he could be during a home invasion. A gunman, who had a homemade bomb made of dynamite, invaded the Jones home in February of 1909. He demanded $7,000.00 and threatened to set off the bomb if thwarted. Jones, in an effort to calm the man, invited him to sit down in the library and talk which they did for over a half an hour. Mrs. Jones became alarmed when her husband did not return from answering the door and entered the library where the man demanded that she sit down as well. The conversation had resumed when the son, Chester, followed his mother into the library and was also told to sit. Jones told the intruder that he didn’t have the money at home but that they could go to the bank for the funds. As they proceeded through the hallway, Lawrence tripped the man, hurled him to the floor, stripped him of his weapons and called the police. The man confessed to the police that he intended to kidnap the millionaire and had a prison cell fixed in a house in Independence in which to keep him. The police later found the house and a closet with chains attached and ready. The man gave his name as Garnett. Eventually it was discovered that he had left his wife and children on a farm north of Dallas two weeks before and his real name was Albert Bledsoe. According to newspaper accounts of the crime, he claimed that he was a cousin, once removed, to the one and only Davy Crockett of Tennessee and Texas fame. He certainly had to be the black sheep of that family. Lawrence Monroe Jones died July 15, 1943, at the age of 87 in Phoenix, AZ. Emma had preceded him on October 30, 1932 in Kansas City, MO. Both are buried in Forest Hills Cemetery, Kansas City, MO. Copyright © 2014 Overland Park Historical Society. All rights reserved. written permission from The Overland Park Historical Society.